MUMBAI: TRA Research has launched the second edition of ‘India’s Most Consumer-Focused Brands 2019’ (CFB), a study measuring the brands’ increase in Buying Propensity, the keenness-to-buy among Indian consumers. Samsung, the South Korean multinational major leads the TRA’s most consumer-focused brands 2019 report this year. It is followed by Tata Motors at scond place and Apple has secured third position with the latter having climbed two ranks over last year. Hero Motocorp has secured fourth slot while Nike is at fifth rank for consumer-focus. CFB 2019 reports the list of brands that increased their buying propensity over last year. This year’s report lists 500 brands based on the buying propensity comparison of two successive years’ data. “TRA’s Buying Propensity Matrix is a scientific brand measurement model that gets to the root of consumer buying behaviour to understand and measure the customer’s buying keenness. It attempts to understand this through the overt, covert and contextual buying drivers of consumer influences. By increasing buying propensity a brand creates a natural pull for the consumer towards the brand measured as a consumer’s trust (the transactional drives to buy) and attractiveness (the psycho-socio-cultural desire drives to buy). These two combine to make the fundamental substrate on which all buying decisions are made,” Chandramouli added. Among India’s 500 Most Consumer-Focused Brands, 37 super-categories and 236 categories were listed. The categories with the maximum brands were F&B, FMCG and automobile contributing to 28 per cent of the total brands in the listings. 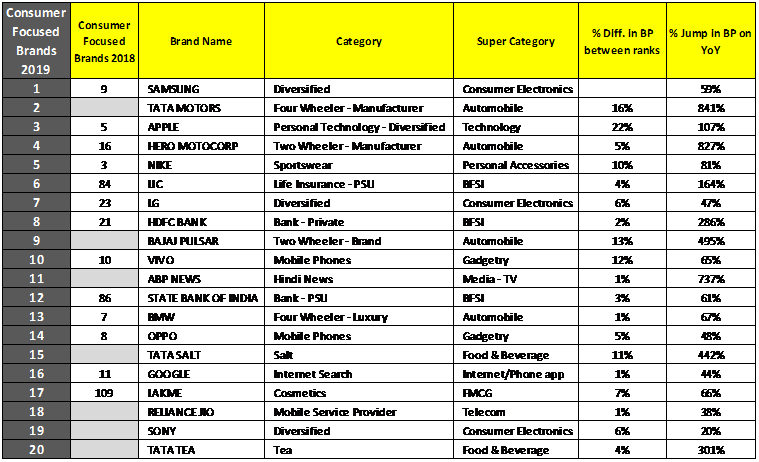 Some of the important category leaders in Consumer-Focused Brands are Panasonic (rank 57) in Consumer Electronics; Liberty (rank 64) in Footwear; Kenstar (rank 163) in Durables, L’Oreal (rank 66) in FMCG; Sun Pharma (rank 76) in Pharmaceuticals; Tata Sky (rank 72) in DTH; DMart (rank 111) in Retail, Fastrack (rank 31) in Branded Fashion, JW Mariott (rank 155) in Premium Hotels, Google (rank 16) in Internet Search, and Kit Kat (rank 135) in Food & Beverage.